WATCH out Ekta, the second ‘K’ Queen is lapping at your heels! After Kora Kagaz and Kangan, Asha Parekh is back again with Kucchh Pal Saath Tumhara on Sahara Manoranjan every Friday at 10.30 p.m. Her new serial, she says, addresses the subject of women’s liberation which no soap has ever touched. She is candid enough to admit that the plot of the serial revolving around widow re-marriage has been inspired by Yash Chopra’s Mohabatien. Defending her women-related themes she says that male-oriented serials don’t work with the audience. "Look what happened to Kangan. It was a very male theme where a man feels shattered when a woman rejects him. It just didn’t work. 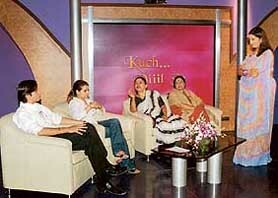 On the other hand, viewers lapped up Kora Kagaz where a devar stands up for a woman ill-treated by her husband." Whereas Mohabatien treated the subject of widow re-marriage romantically, Asha Parekh has added a dash of poignancy and pathos in her new serial. And she is fervently hoping that the Yash Chopra magic would rub off on Kucchh Pal Saath Tumhara. Much before she signed her long-term contract with good fortune, she didn’t have a clear choice in front of her. "My mother wanted me to be an IAS officer. My father wanted me to join him in his business. But I wanted to be a star," says Smriti Malhotra Irani. Today, there’s a flush of triumph in her voice when she says, "As I’d have succeeded in any field—-acting, civil service or business!" As Tulsi, the widowed bahu of Kyunki Saas Bhi Kabhi Bahu Thi, Smriti has a big reason to feel on top of the world. Now she has one more reason. And that is Kuch Diiil Se [never mind the spellings]. The Monday to Thursday talk show on Sab TV at 2.30 p.m. revolves around social issues where lawyers, cops, psychiatrists, doctors, social workers and celebrities answer viewer queries. "It’s an attempt to take up issues which concern all of us. To find solutions by making people talk and then act. The change might happen in a small way, but at least a beginning can be made," says the former Miss India contestant whose popularity has resulted in her getting a host of ads. From Kucchh Pal Saath Tumhara and Kuch Diiil Se to Kucch Kar Dikhana may be a small step for TV channels but it’s a big one for Shruti Seth. Shruti has done it all— modelling, acting and VJing. After modelling for high-end products like Dominos Pizza, Ponds Talc, Frooti and more, she debuted on TV with a cameo in Desh Main Nikla Hoga Chaand. Then came, Josh, Kyun Hota Hai Pyaar followed by Shararat where she plays a witch named Jeeya. Now she’s all pumped up for Kucch Kar Dhikhana Hai every Friday at 8.30 p.m. on Star Plus which she co-anchors. "It’s fun when I am anchoring or vjeeying as I get a chance to be myself. On the other hand, I enjoy acting because I get to be someone else," says Shruti currently VJing First Day First Show and Junglee Juke Box on Channel V.
One would have thought that with her plate full she would be a content young lady. No, says Shruti, " I am looking for a real challenging role that has shades of grey and black. I’d love to play a negative character." And once she begs a vamp’s role then Sheetal Singhania and Ramola Sikand better take cover. She could give them a run for all their arched eyebrows and conniving smiles. 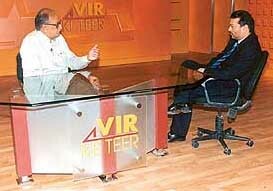 With M.J. Akbar’s Darbar and Karan Thapar’s Face to Face making waves on TV can Vir Sanghvi be far behind? After chatting up with the who’s who of India, Sanghvi too is going in for a quick makeover. Vir Ke Teer on Star News, every Sunday at 10 p.m, probes into issues that have concerned people the most—-political murders, financial scandals, Bollywood’s links with the underworld and many other real time happenings. Sanghvi goes back in time to dig up various issues and narrates sensational events including views and analyses by those who have witnessed the events or have been key players and can provide an insight into the issue. The most of 180 talk shows is now going beyond Sonia Gandhi, Rupert Murdoch, and Richard Branson to touch upon subjects that affect the lives of common people. Which makes the show worth watching because of its for its incisiveness and in-depth reportage. Silver screen dreams aren’t always rosy and not every TV star can become a Shah Rukh. That’s the truth small screen heroes are learning the hard way. When the fog surrounding Dhund settled, Amar Upadhaya, aka Mihir, came face to face with reality— in Bollywood fortunes are made and unmade every Friday. And he is not alone. Giving him company is doctor-turned-TV star Anuj Saxena who shot to fame as Abhey in Kkusum. The doc left the small screen without signing any movie. But soon enough he realised his mistake and retreated back to the comfort of Kkusum. Of course, there are plenty of excuses. " It was difficult to say no to Arunaji..." and " It’s easy to put your foot back in your old shoe." But no one’s getting fooled. They would have done better to ask TV stars like Renuka Sahane, Palavi Joshi, Navneet Nishan and Pankaj Kapoor. Unlike politics, floor crossing seldom works in showbiz! Travel to northwest India and join animal activist Snehal Bhatt on her one-woman quest to rescue the country’s most notorious snakes — cobras, vipers, and giant pythons — from frightened villagers, crooked charmers, and devious poachers. The Snake Wranglers: Snake Savior, Sunday, July 6 at 7 p.m. on the National Geographic Channel, Profiles animal activist Snehal Bhatt who for over a decade, has led a one-woman crusade to rescue India’s most dangerous snakes. Now, with the situation in her home city of Vadodara well in hand, she’s taking aim at the rural town of Valsad. There, poachers continue to trade illegally in such snakes as Indian pythons, and snake charmers still perform, defanging snakes and ultimately killing them. With the help of a posse of dedicated volunteers, Snehal does battle with the charmers and poachers, and helps save people and snakes from each other. This is your chance to meet this gutsy lady on a very unusual mission.